Our Dedicated Servers and VPS's with cPanel are very popular among our customers. The easy to use administration panel renders web hosting comfortably even for inexperienced Linux administrators. Almost all settings can be done via WHM, SSH access is rarely necessary. We deploy cPanel servers automatically with a working standard configuration. Most settings are left default, some had to be added to make the server accessible. I want to show you a few points that are important after the installation. The following steps can be done in your server WHM. Please log in to https://[server-IP]:2087 as root to continue. Even if you have not worked with the WHM interface yet, you will be able to navigate through it easily. I find the search bar very useful to access the needed function quickly. It acts similar to the Windows 7 start menu search. 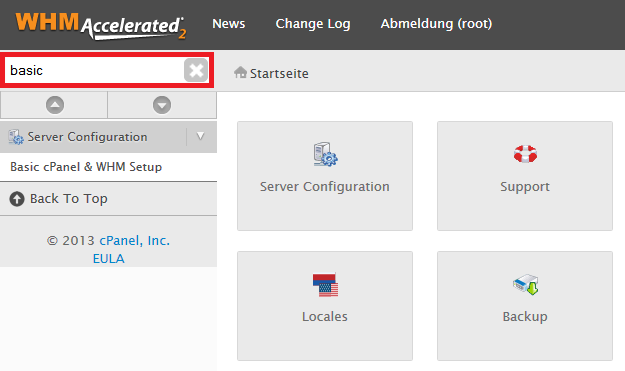 We start with Basic cPanel & WHM Setup. Notice the contact e-mail address in the first configuration line. We recommend changing it to a personal address to keep yourself informed about server activities. cPanel is quite active in this regard, so a separate in-box is advisable. You will find the default nameservers at the bottom of the page. We have predefined our nameservers here. Domains that you bought from us will work out of the box using this setting. If you run domains on other nameservers, you can define their addresses here. We continue with Configure Remote Service IPs. Choose the tab Remote Name Server IPs here. The following list of IP addresses are associated to the nameservers defined before. If you only use domains from us, no changes are necessary here. If you have domains on other nameservers, you can add their IPs to the list. Otherwise cPanel will refuse to add those domains as addon domains. The next point is Change Hostname. Our predefined hostname does not resolve to your server IP by default. You will have to define a new one with a working domain to avoid problems with e-mail transmission. You may leave the first section as it is, e.g. "vmi1234.example.com". If you use a domain that is not hosted on our nameservers, make sure to add an A entry for the sub-domain in your DNS management. A correct RDNS entry is another important factor for RFC compliant e-mail transmission. The PTR of an IP must match the server hostname. Please use our Customer Control Panel to set the entry for your server IP, e.g. "vmi1234.example.com". Update 19 December 2014: We now set a default host name in the contabo.host zone which resolves correctly. There are no adjustments necessary in this regard anymore. After these steps, your cPanel server is ready to fulfil all general hosting tasks. If you need more help material, please see the comprehensive cPanel documentation. Thats really usefull information about basic server setup. But there should be little more information described about security center features like enable Cphulkd and setting up SMTP restrictions. I mean just basic level of security that will help to lock down server. This is really useful, I simply dont know why my php.ini setting in public_html dont want to overwrite the default php.ini file, I even tried using Htaccess but I am getting 500 internal server error. Thanks for your comment. In order to further assist you, kindly contact us via e-mail at support@contabo.com from your authorized e-mail address (you can manage those within you customer control panel) and our team will gladly assist you further.